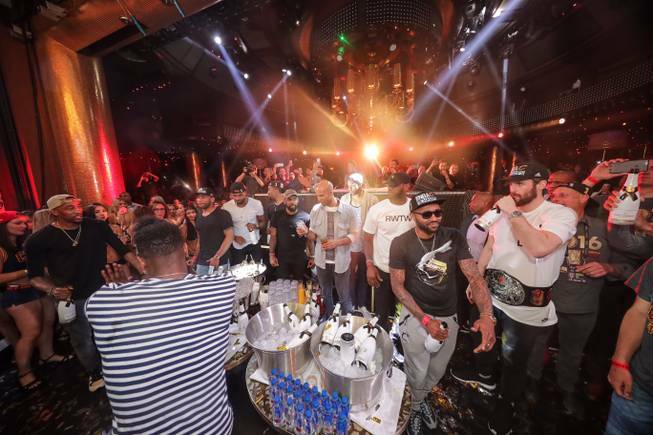 In all, 75 bottles of bubbly and one 6-liter magnum were imbibed and sprayed by the barons of basketball on their unexpected detour by private jet to Las Vegas while en route home to Ohio. 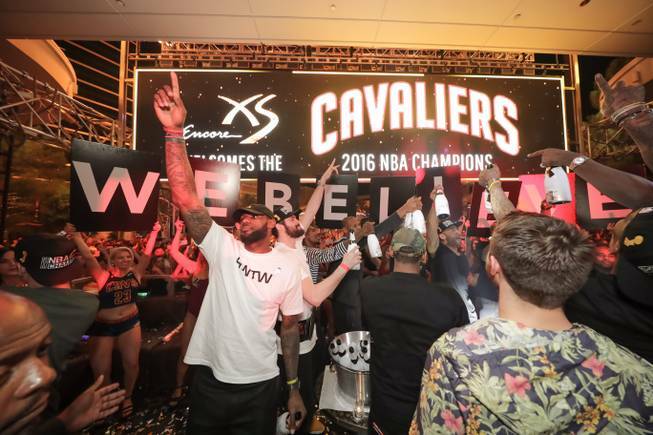 No sooner did they clean out their lockers in Oakland, Calif., at the home of the Golden State Warriors, who they’d vanquished 93-89 on Sunday night to win the trophy for the first time in 52 years, than the unstoppable LeBron James MVP train detoured to Wynn Las Vegas here on the Las Vegas Strip. 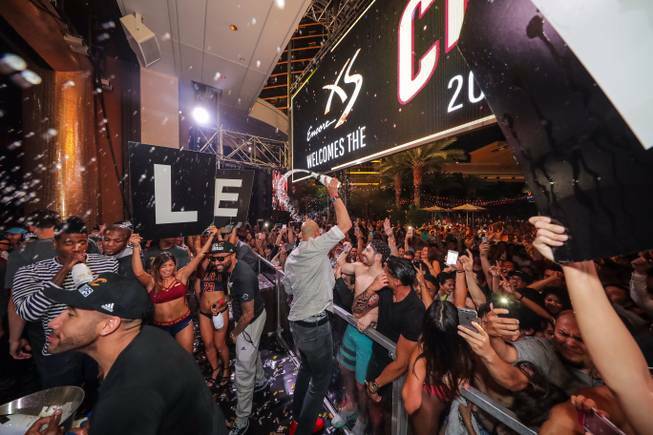 They arrived at McCarran International Airport at 1 a.m. and headed directly to the award-winning mega-club. 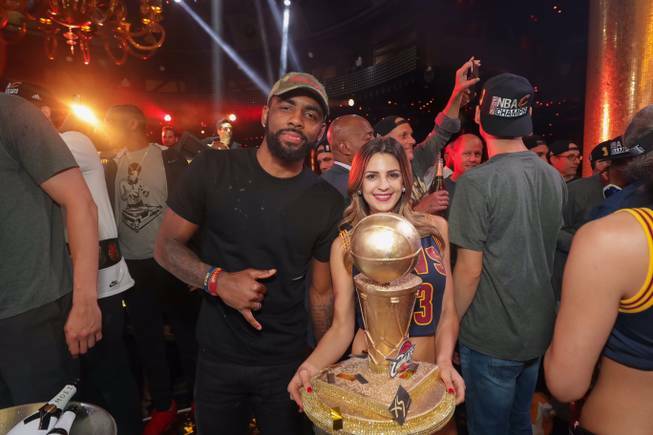 Gorgeous cocktail servers were already decked out in LeBron jerseys with a custom cake made to replicate the Larry O’Brien championship trophy. 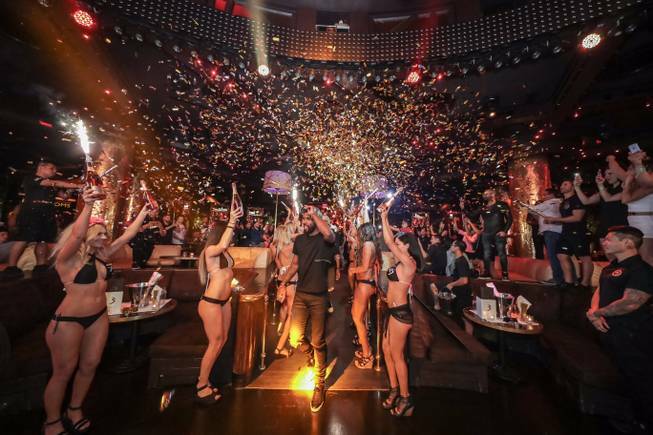 With sparklers flaring and confetti flying, they formed a tunnel to the VIP table where the first 50 champagne bottles were ready for the party of champions. LeBron led the lineup of players Kyrie Irving, Kevin Love, Richard Jefferson, J.R. Smith, team owner Dan Gilbert and head coach Tyron Lue and the remaining players of the NBA’s new top team. It was an unforgettable moment as two teammates grabbed champagne and sprayed it into the crowd, then over each other. Coach Tyron wound up getting drenched from most of the bubbly from the immediate 25 replacement bottles. J.R. was so soaked with champagne that he simply took off his shirt and kept it off for the night. 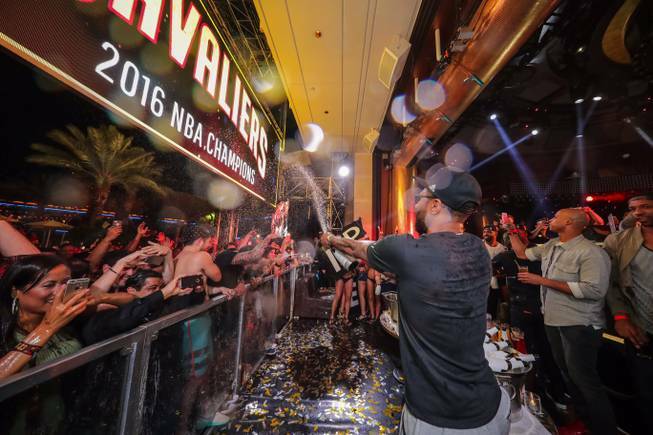 Kyrie drank his toast to success right out of the Moet bottles. 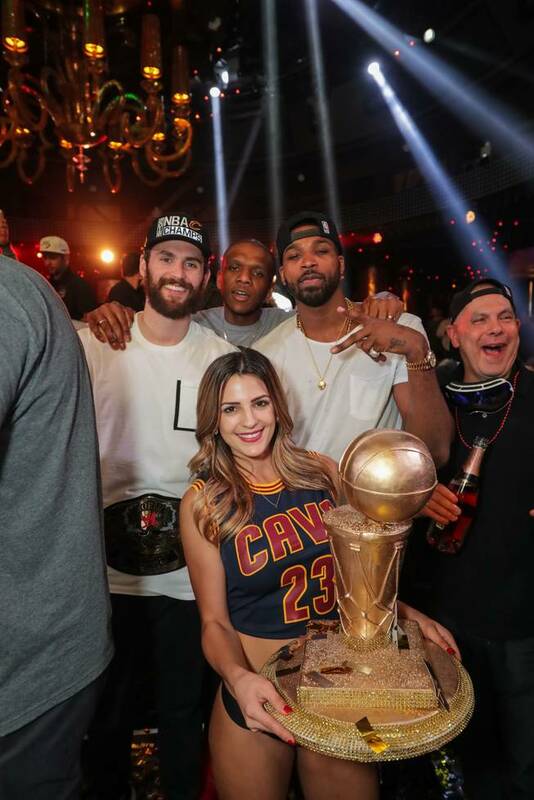 DJ Alesso ramped up the wheels of steel for a soundtrack that kept the festivities going till nearly dawn for a night the Cavs won’t forget. Our thanks to Tony Tran for his photo gallery of the celebration. They all wound up at nearby Allegro for its Italian-American menu of taste treats to fuel up before ending the detour and jetting off to continue the journey home to Cleveland, where this afternoon’s even-bigger celebrations await.